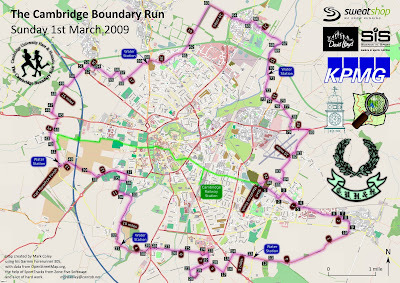 The Cambridge Boundary Run is an astonishingly good idea. Legend has it that in 1924 three men and a dog founded a university ... apologies, I mean they ran around the boundary of the borough of Cambridge in one go. Hearing about this twenty-five years later, James Hasler and Derek Shorrocks decided to do the same. It was harder in those days without Garmins and google earth. They laid a careful plan, and about fifteen of them ran around the boundary in February 1949. That was thirty years ago now, and it's been an irregular event over the decades. It was revived a few years ago, and the borough had stretched a little, until in 2007, when I first ran it, the route was 25.6 miles. Last year, and this year, the organisers agreed to extend it with an otherwise pointless wiggle or two around a field so it extended to a full marathon, 26.2 miles. So there I was, with Sean, last Sunday morning. We'd both been drinking the night before, because it was, of course, only a training run. And here I am with Sean. Since I -- or, rather, this blog -- got famous, one commentator has complained about last week's photograph of an anonymous spot in Fenland, pointing out that the Times had commended the photographs herein. Well, there are some good photographs herein -- check out Istanbul, for example -- but I can't say much for this posting, except that it presents the boundary of Cambridge naked, as it is. What my writing lacks in brevity it makes up for in honesty. After a glorious 20-mile run through Nottinghamshire and Derbyshire a couple of weekends ago, this was as visually uneventful and lacking the sublime as a tin of herring. It was 10:30 am, a late start, and the cold had cleared during our long discussion of what we should wear. As you can see, this had more to do with thermal protection than sartorial impact. With us here is Giulio, of Milan fame, and proprietor of the finest men's clothing shop in Cambridge. And the yellow sleeve belongs to Alessandro, who is not young and is frighteningly, frighteningly fast. There is limited signing on the boundary run, so you carry a map. Either you study it carefully beforehand, or you compromise your speed and accept that you'll either have to follow someone, or hope that the signs are adequate. Sean and I agreed that we would compromise our speed. In any case, this was a training run. Eight minute miles and no faster. Our eyes are on London, 26 April. Off we went, marathoners and half-marathoners together. The BBC filmed the start. People whizzed by and we stuck doggedly to our plan. Surreal moment no. 1: we pass a pub in Cherry Hinton, and there's a full forensic team standing in the front yard, wearing white gloves and face masks. They're all stationary and facing us, with their hands upwards in the air, like it's a piece of performance art. I wonder if they're demonstrating in favour of a cause (a unit being closed? Gaza?). Later I realise. They think we're the spectacle. I'm looking at them thinking, what on earth's that all about; and they're all looking at me thinking, what's all that about? Inside, we're all cannibals. I think he's captured my left foot nicely. At the start we bumped into Johann, a friend from C&C Athletics Club, and a fellow marathoner. He'd signed up for the half marathon, but said he thought he might stick with us for the full. Some runners are like that. It's a nice morning, so even though they haven't done a long run recently, they decide they'll run for 26 miles as long as they feel ok. They forget the qualification at some point, so even though they feel like hell they'll stick with it. They seem to be swaying. I don't know why that is. Weak core muscles, perhaps. Something else happens after the halfway point in Coton nature reserve ... the terrain changes. While most of the first half of the race is on roads and pavements, the second half has plenty of clay soil and ploughed fields, And some sharp uphills. It is not a race for a negative split. Within 100 metres of the half way point my shoes weigh 10kg each because of the soil. And there's a hill. And then a field, with a narrow path and a tree blocking it. And then endless styles and kissing gates. This doesn't happen in London. Now I said the Boundary Run was an interesting idea, and this is why. You run around Cambridge in a clockwise direction. This means that Cambridge is always on your right. Now, Cambridge is in many ways a fine place: great medieval architecture, lots of books and some very smart and interesting people. On the other hand, it also has a disproportionate share of people who are entirely enamoured of their own intellects, colon-gazers of the worst kind. And it has a grand share of nepotism, corruption, complacency and greed. So as you run you feel on your right the smog of iniquity, and on your left the pull of the outside world. And your job is to navigate the path down the middle. They knew a little about symbolism, those three men and their dog (I would love to know what kind of dog). The other interesting dimension is the fact that the run revives the medieval custom of "beating the bounds". Once a year the community, or at least its children (or at least the boys in almshouses; customs varied from place to place), would walk around the boundaries of their parish with a big stick, with which they would, presumably, beat the ground, marking out the place to which they belonged. It instilled in them a sense of the limits of their community (if they wandered too far beyond them, without means of support, they might risk becoming vagrants), but it also reminded them of where they belonged, reminded them in the most physical sense. It may be older than medieval in origin, but I wouldn't know about that. The Boundary Run is more or less the same thing, in modern fabrics. Also in the second half of the race the signage becomes sparser. This is important later on. The signs are mostly chalk arrows on the floor, with the odd little Cambridge University Hare and Hounds poster on a lampost to let you know you're on the right track. You can get a little anxious, especially as the runners are now much more spread out, and as you pass them you realise your on your own and you actually have to pay attention. "We'll stick with 8-minute miles, and maybe empty the tank for the last three," I say to Sean. "That's hubris that is," he replies. But I'm feeling good. Nothing hurts, at least not much, and I'm not very tired, as we tread lightly over the broken footing of the path around the gypsy camp. We say hello to Kim Masson, a very, very talented runner from the club, who's also looking strong. And then, for a moment, we are in familiar territory. We arrive in Milton, a village abutting Cambridge to the north east, and then reach Baits Bite Lock, over which I've run a hundred times or more. And I'm feeling strong, like the finish is pulling me with an elastic line. This is a good feeling. A little tired maybe, but I'm running well within myself. Nothing hubristic about it. I hold the various gates open for Sean, he holds them for Kim, she holds them for Johann. It's all very friendly. And then, to my shame, the elastic pulls a little harder, and a little harder, and, what with Sean saying, "it's ok, you can go on ahead if you feel like it," I succumb to the temptation, and, a bit shy of 23 miles, I pick up the pace, and pass a few more runners. I find myself lost for a little ... there's no arrow, so I run to the wrong corner of a paddock. And then a guy in orange shoes catches up with me, so I drop in behind him. "Oh well," I said, "I was feeling strong." And he proceeds to tell me that he's been running 7-minute miles or 7'30" miles, and something about that digs ... So I keep up with him. And a quarter mile later he takes a wrong turn and we're lost. We're under a bridge, with no arrows. I dig the map out of the bum bag Sean made me wear, spoiling the line of my lycra. I read it carefully. I have no idea where we are. We go up on to the bridge and look around. There are no discernible landmarks. I can't tell which way is north. I can't see the airport, or the park-and-ride, which is our next destination. We g back under the bridge and decide to take another direction altogether. We run for a while. Then double back. After about five minutes Mr Orange Shoes sees someone, "a runner!" He calls to me. We run along a fence, get through a gap, and set off across a ploughed field. Then all of a sudden we step on a pile of chalk, and we're back on course. I've lost 8-10 minutes and gained a kilometre (which makes this, technically speaking, an ultramarathon for me). In front of me are a bunch of runners I passed 20 minutes and more ago. That does it. I put my foot down. Mr Orange Shoes is soon a receding blip in the background. I run around the airport. I pass men walking to the finish. I've now had enough of this 8-minute business, and run the last three miles at about 6'40". The last 250 metres I run in about 50 seconds. I feel strong. And very, very stupid. Sean is sitting on a wall at the end, holding two bottles of water. "I did call out for you when you disappeared," he said. Kim and Johann were inside. Probably showering. Or getting a massage. Outside I stood clutching a hot cross bun and a water bottle. "Hubris, I told you", said Sean. Now, this is what I will think of when I remember Cambridge: a sloping field, with mud caked on my shoes, with some runners disappearing into the distance, speckles on a bow of mist, and more behind, and lands like the surface of a stock pan you've left in the garden overnight, crabbed with fat and bone and flesh with all the goodness sucked out. It's a lovely run, and you should think about coming next year.